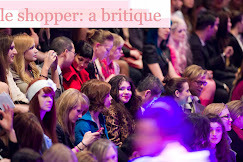 le shopper: a britique: It's Practically Magic! So, I was feeling a little nostalgic and watched an oldie but a goodie... Practical Magic! It's a lovely tale of two witchy sisters trying to keep the love of their lives alive- while trying to break a curse, banish an evil ex-boyfriend, and keep their families together. I know, sounds like a lovely tale. Well, that's the movie in a nutshell... and I must say that the summary does not do the visual aspects of the film justice. The small town surroundings are very 'Stars Hollow-y', and the music, well-- if you love the 90s and a Dawson's Creek-esk mix CD, then you'll truly enjoy the tunes. Also, and most importantly, the stars of the film, Nicole Kidman and Sandra Bullock- and stunning. The costume designer, Judianna Makovsky, really showed the best of the best. She demonstrated so many looks! 80s, 90s, Heroine Chic, Biker, Girlie Girl.... it's hot, hot, hot. My favorite look from the film is seen on Mrs. Kidman herslf.